Stephen Seehorn and I have released an incomplete English translation patch for Madou Monogatari for the Sega Game Gear! It is incomplete because we have not fully tested it. The full script has been inserted and should be fully playable but we make no guarantees. There are text bleed issues. The script has not been checked. The ending text is gonna be screwed up because we have no way of knowing where the text speed pointer is without actually seeing it display and tracing it backwards which requires beating it. Otherwise it's pretty awesome. NOTE: Patch is in Ninja format. Enjoy! Can't try it just yet, since I have an exam tomorrow. >_< Anyway, I'm excited! 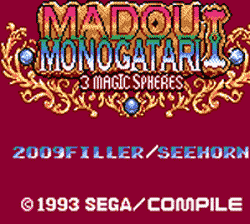 I'd love to play more Madou Monogatari in English! Translated Puyo Puyo games here! Madou Monogatari traditionally doesn't *have* a life or magic meter. You have to judge Arle's condition based on her expression and the text that accompanies her getting hit each turn. Last question, what is -then- the text dispayed in background, behind the main windows? Not sure about text displayed behind the main windows; didn't watch that far. But a lot of magic is "free" especially basic spells like Fire and Ice Storm. If you cast a spell that isn't free she'll say something afterwards, like "I'm full of magic power!" 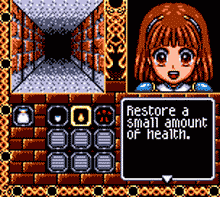 In Madou Monogatari for the SNES (of which Madou Monogatari I for GG is the final dungeon, albiet in a much-simplified form) Arle starts out with the Healing spell, I think. And Bayoen. Both cost magic, and she'll tell you how much magic she's got when you use them. If you cast some magic like healing, Arle will report on the status of her magic after she is done casting like "I still have some magic left". Obviously if she starts complaining about her magic being low you may want to consume a magic restoring item. The text displayed behind the main windows I'm not really sure what you mean. The only thing I can think of is the text bleed that happens as you approach the shop near the beginning. Once it occurs it persists and the text will change but it's all just copies of bits of text that appears during dialog. It's not part of the game, just a glitch. Yeah that's just where I didn't line break one sentence in the right spot so it bleeds into the border tiles. The text changes because it's assigned one of the tiles in VRAM where the VWF is built. Unfortunately the game never refreshes those border tiles so if it happens once it's there until you save/reload which is pretty annoying. Hopefully someone who plays through it can send me a list of all the sentences that bleed and I can fix them. Also sometimes the text from one side will appear in the other side if there's too much, that's because space in VRAM is very limited and if one sentence goes too long it uses tiles allocated for the other side's text. That I couldn't figure out a way to fix since both VWF tile sets need to be in VRAM at once. Someone has not only found a bug but taken the initiative and fixed it themselves! Good samaritan Sfon emailed me today with a patch for the game that claims to translate the cardinal compass directions from Japanese to English. I have not tested this myself, but the included screenshots testify for the results. For now you may grab this patch from my Madou Monogatari (GG) page. Wouldn't it be better if you have a place where people can dump bugs instead of sending emails? So people can see what's already reported. I have no arguments with this. Bug reports go here: http://puyonexus.net/forum/viewtopic.php?f=14&t=1583 I'll put a link to it on my project page.